Mayors from 10 major US cities are working together under the City Energy Project to significantly increase energy efficiency in buildings – their biggest source of energy demand and carbon pollution. Funded by a partnership between Bloomberg Philanthropies, Doris Duke Charitable Foundation, and The Kresge Foundation, it is being managed by the Natural Resources Defense Council (NRDC) and the Institute for Market Transformation. The 10 cities are (with more to follow): Boston, Philadelphia, Atlanta, Orlando, Chicago, Kansas City, Houston, Denver, Salt Lake City and Los Angeles. "We have the skills and technology to make buildings more efficient, but we need a coordinated effort by major cities and the private sector to make it happen," explains Cliff Majersik, executive director of the Institute for Market Transformation. Each city will receive funds to hire a full-time consultant (for 3 years) that crafts and helps them implement a customized efficiency plan that builds on programs already underway. The consultant will also facilitate interaction between cities to share best practices. "There are a lot of models out there – we’ll be helping walk some of the cities through the options," Laurie Kerr of NRDC told Midwestern News. "There are a mixture of options cities are looking at – some are ordinances, some are policies or programs, ways of providing financing, working with a Property Assessed Clean Energy (PACE) program or creating an energy efficiency financing entity. Encourage leadership from universities, hospitals, and other major stakeholders. "With U.S. buildings consuming more primary energy than countries like Russia and India, the scale of the opportunity to optimize building energy performance is significant," says John Mandyck, Chief Sustainability Officer of UTC Building & Industrial Systems. "Cities collaborating and implementing creative, practical energy efficiency polices can go a long way to reducing America’s $450 billion annual energy bill and carbon emissions." 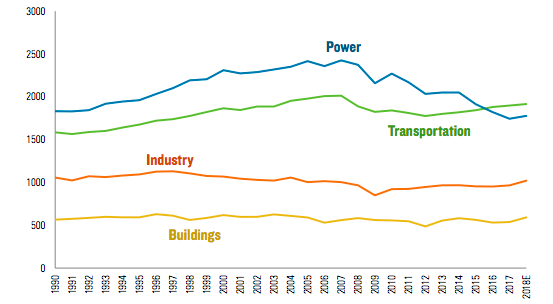 Largely due to electricity consumption, buildings emit 40% of US carbon pollution, the largest single source in the US. At the city level, over half of carbon emissions come from buildings and can be as high as 75%. Worst of all, much of that energy is wasted. In Chicago, for example, its tall buildings produce 71% of the city’s greenhouse gas emissions and require some $3 billion a year for operations. In NYC, 75-80% of emissions come from large buildings. "With 10 cities involved, it will impact hundreds and thousands of buildings, which will lead to an extraordinary impact, Karen Weigert, Chicago’s Chief Sustainability Officer, told Chicago Sun-Times.